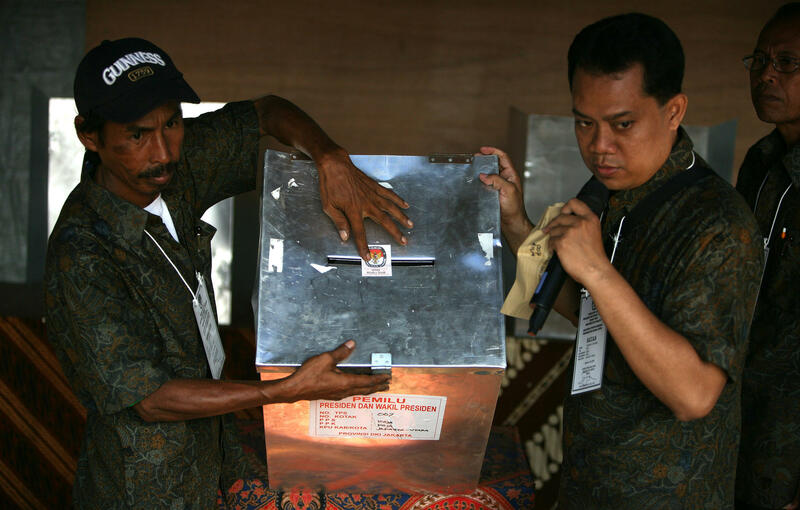 Two polling booth attendants seal a ballot box full of votes in Indonesia’s 2009 presidential elections, which observers claimed to be relatively transparent and legal. This is campaign season in several places around Asia. India has already started voting in elections that will last for a month. And in Indonesia, voters go to the polls tomorrow in one of the most complicated elections in the world. When you consider Indonesia, it’s easy to get overwhelmed by the numbers alone in a country with a population of some 270 million. It’s an island archipelago — the exact number of islands is an estimate, but the UN puts it at nearly 15,000. And then there are the elections that take place tomorrow with nearly a quarter of a million people running for office. The president will be chosen, along with the legislature and a series of regional and local positions around the country. The Jakarta Post tallied up the numbers, and there are more than 245,000 candidates for office. There will be more than 800,000 polling stations to look after the more than 192 million people who are expected to vote. On a national scale, polling shows President Joko Widodo is expected to win re-election – he faces the same person he ran against five years ago – retired Army general Prabowo Subianto. The presidential campaign has featured appeals to a growing millennial electoral base — demographers say those between the ages of 17 and 35 now amount to more than a third of the country’s voters. This will be Indonesia’s fifth democratic election since 1999. And so far, all of them have been peaceful.